After struggling early in Game 1, Fenerbahce Ulker Istanbul came out with a vengeance, took a big early lead and never looked back en route to an 82-67 victory over Maccabi Electra Tel Aviv. Andrew Goudelock led the way with 17 first-half points as Fenerbahce took a 2-0 series lead and moved within 1 win of its first appearance at the Turkish Airlines Euroleague Final Four. Maccabi hosts Game 3 – and if necessary, Game 4 – next week in Israel. 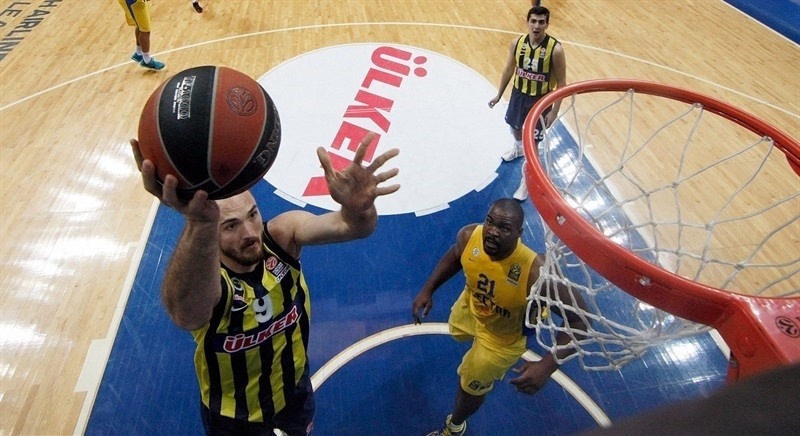 Fenerbahce started 9-2 and extended the difference to 27-11 before the end of the opening quarter. 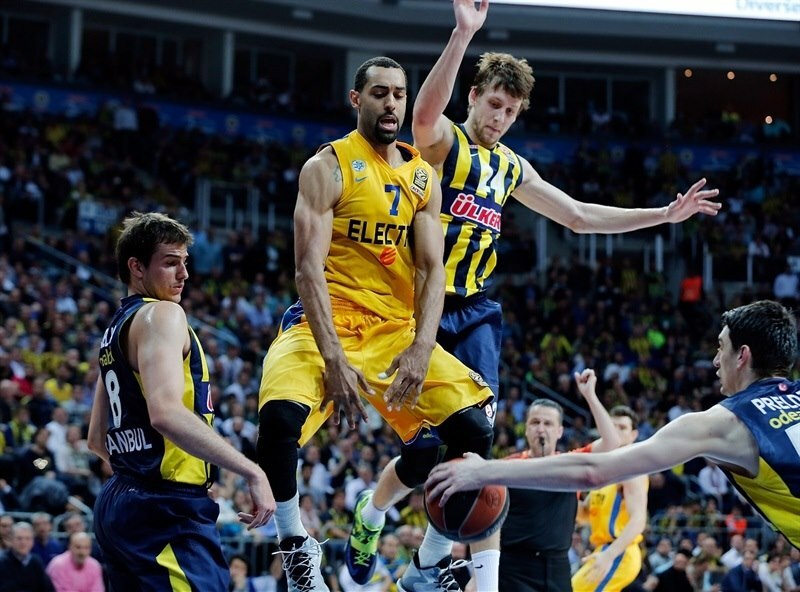 Fenerbahce led 50-34 at halftime and pushed the advantage into the 20s in the third quarter. 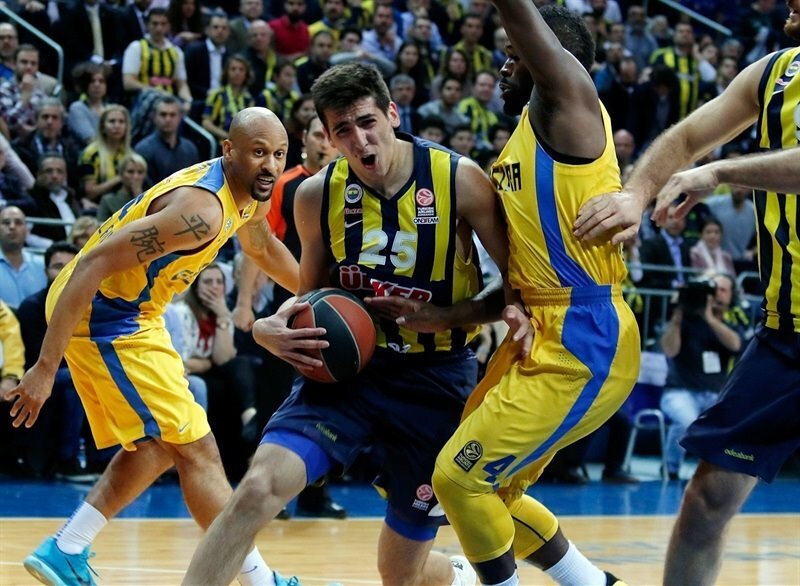 Maccabi rallied to get within 12 in the fourth quarter, but Fenerbahce responded before there was any real danger. Goudelock finished with 19 points, Semih Erden tallied 12 on perfect shooting, Bojan Bogdanovic added 11 and Nemanja Bjelica came within 1 rebound of the Euroleague’s playoff record with 9 points and 15 boards. Fenerbahce outrebounded Maccabi 43-29. Jeremy Pargo led the visitors with 16 points, Brian Randle added 13 points and 5 steals, Nate Linhart scored 12 and Sylven Landesberg11 in defeat. 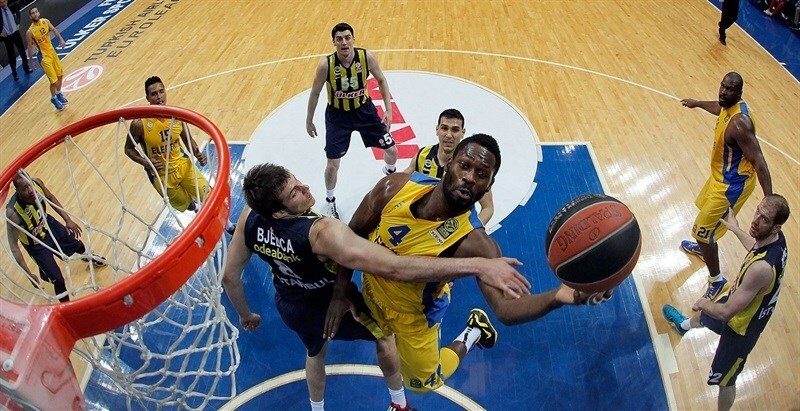 Coach Obradovic provided a surprise in his starting lineup with Kenan Sipahi starting and guarding Pargo. Maccabi won the opening tip and Randle scored first, but the momentum was soon with the hosts. Bogdan Bogdanovic started things with a three-pointer before Erden made an impact with a layup from Bjelica and a put-back. 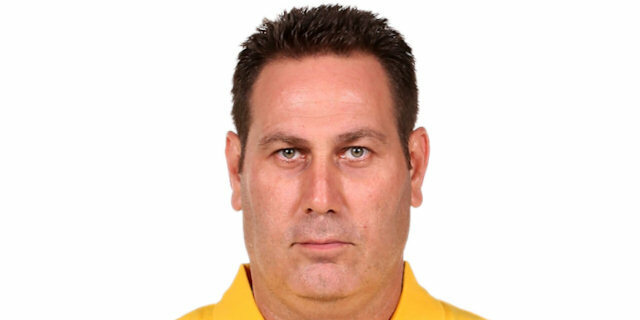 After Goudelock torched the Maccabi defense for a layup that made it 9-2, Maccabi coach Goodes called timeout. 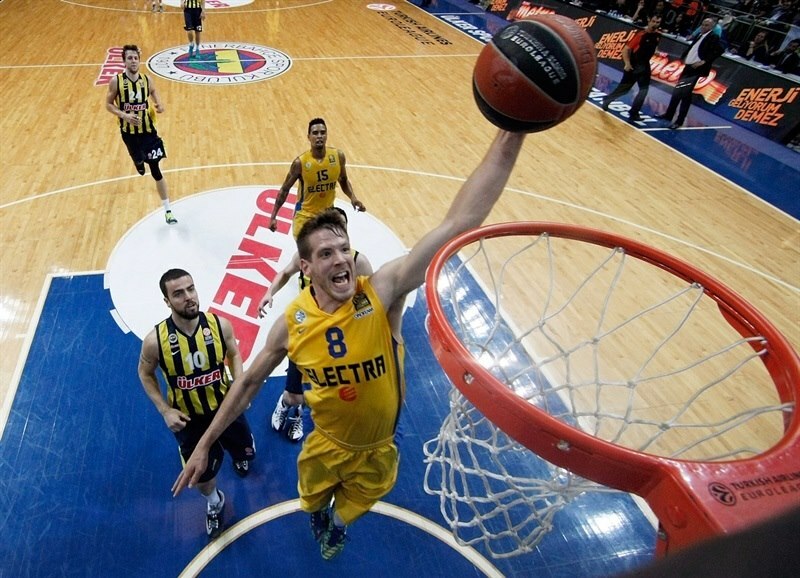 Landesberg ended the three-minute Maccabi drought, but Erden dunked on two Maccabi players at the other end. Goudelock added a layup-plus-foul. Randle kept the Maccabi fight alive with a three-point play, however Sipahi got on the scoreboard with a three-pointer. When Bjelica split free throws, the hosts already had a double-digit lead. Pargo drove for a tough layup only to see Goudelock match him. 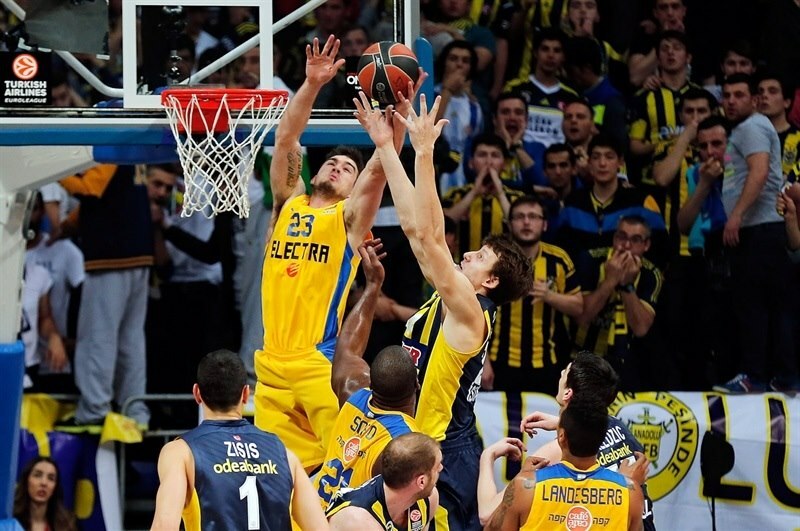 Landesberg scored again, but Bjelica drained a high-arching shot and the foul shot that came with it. Nikos Zisis made it 27-11 with a three from the corner. Pargo fought through the Fenerbahce defense for an impressive layup-plus-foul, but Zisis knocked down a second three for a 30-14 lead. Devin Smith penetrated for a tough layup on the last second of the shot clock. Randle scored next to make it 31-18. 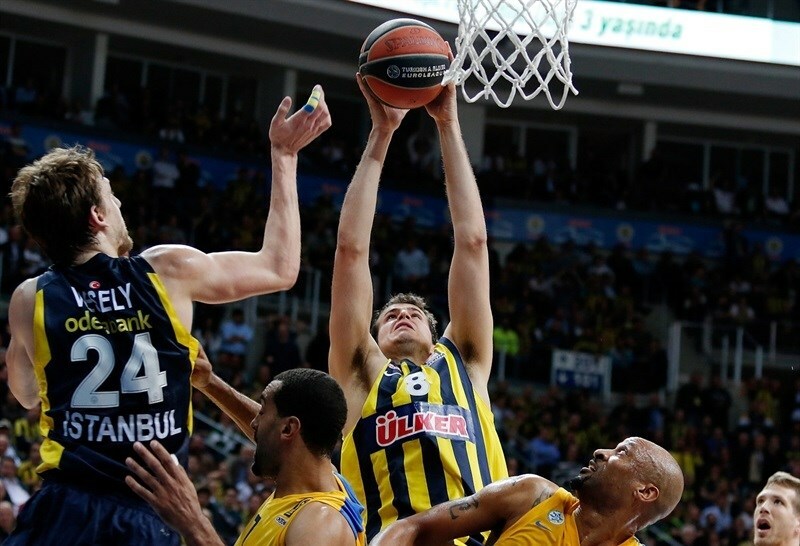 Jan Vesely scored his first basket for the hosts. Alex Tyus battled for an offensive rebound, score and foul. Pargo narrowed the deficit to 10 with his first three-pointer. After a timeout, Erden came back and picked up where he left off with a one-handed slam. Goudelock added a jumper and Vesely finished a fast break with a high-flying slam for a 39-23 lead. After a Maccabi timeout, Linhart came in and buried a three, but Goudelock continued to push the hosts with 2 more free throws. 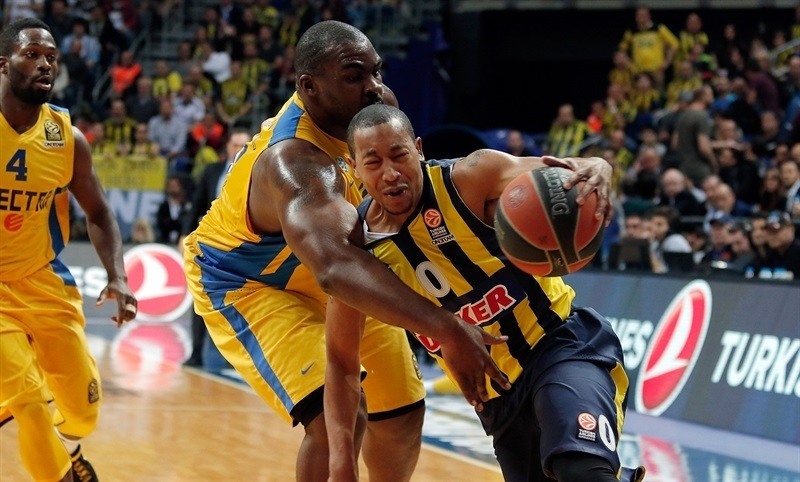 A Goudelock triple put Fenerbahce up 18, but Smith matched him. Goudelock continued his scoring clinic with a fadeaway jumper in the paint. Tyus got to the line, where he made 2 free throws, but a Preldzic triple took the difference to 19. Linhart’s second three made it 50-34 at the break. Bogdanovic connected from downtown to start the second half. Erden produced another highlight with an offensive rebound, slam and foul drawn as the difference reached the 20s for the first time. 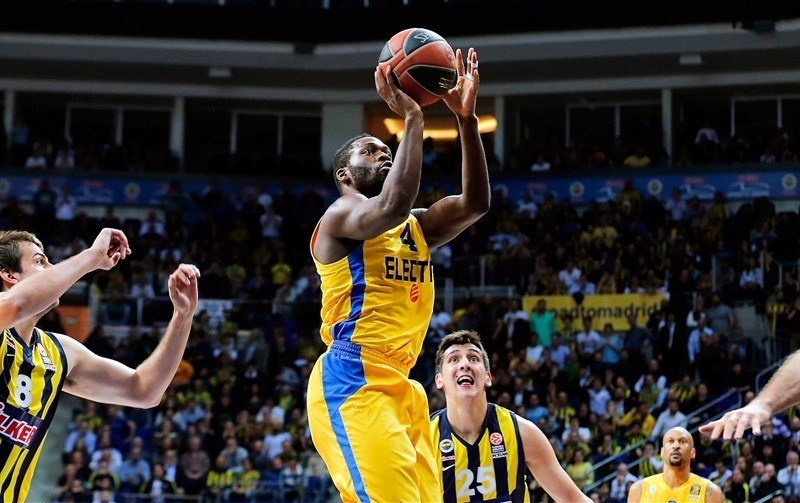 Smith found his way to the basket for a layup and Pargo impressed with another tough bucket, but an Erden slam showed that the hosts were still in control. Pargo countered with a basket-plus-foul only to see Bjelica connect from downtown to make it 60-41 midway through the quarter. Preldzic connected on another Fenerbahce triple. Yogev Ohayon drove for a basket and Landesberg drained a triple. 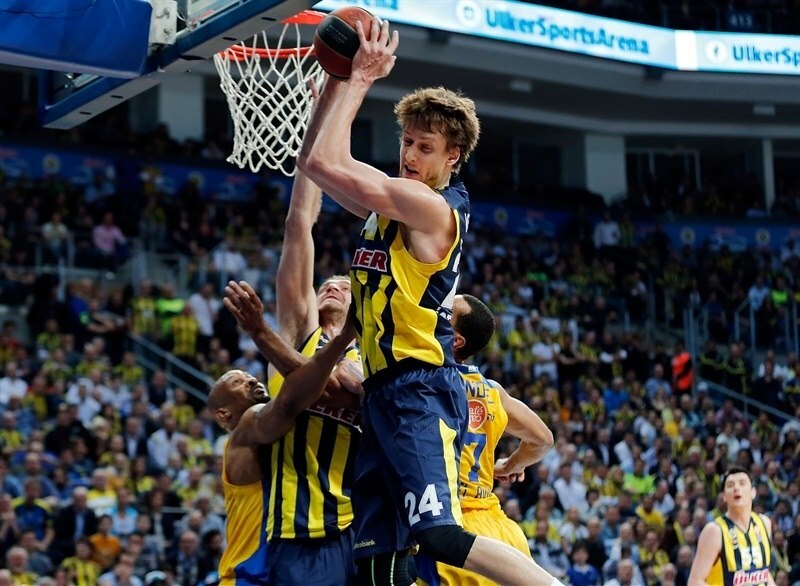 Joe Alexander rejected Vesely underneath, but Luka Zoric made up for it with a layup. Alexander and Zoric traded free throws. Pargo ran the pick-and-roll with Randle, which produced an alley-oop slam for the latter. Vesely stole a pass from Randle in the backcourt and dunked it, but Pargo finished the quarter with a triple at the buzzer to draw within 68-53. Randle shined with a steal and then a pass from the floor to Linhart for a slam to trim the deficit to 13. Alexander fouled out for Maccabi and Pargo was called for a technical foul after arguing a call. 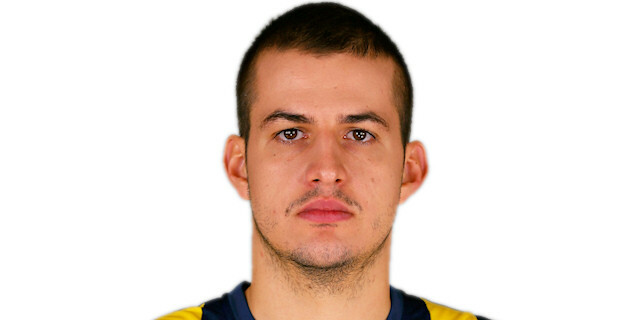 Melih Mahmutoglu capitalized with a three-pointer. Randle added a baseline jumper and later a tip-in to bring the visitors within 71-59 with five minutes to go. Bogdanovic and Bjelica scored the next two baskets to reestablish a 16-point difference. Goudelock and Landesberg traded shots, but time was running out on the champs. Landesberg’s basket-plus-foul with less than two minutes remaining only made it 77-63 and the hosts rolled to another victory and a 2-0 series lead. "Game 2 is a really important one and I think we played very well. We started very aggressive and because of that, we got a good lead in the first quarter, 30-14. It is logical, we tried to change some small details and I believe we did a great job tonight. So congratulations to my players for a very important victory and of course to our fans, who once again made an excellent atmosphere. It is good to be 2-0 before we go to Tel Aviv, but I have experience and know how difficult it is to play over there and how proud Maccabi is. We have to be ready to play there. So we have time until Monday to prepare ourselves and to try to play better than in the first two games. The goal is simple: we need one more victory." "We didn’t do any of the things we spoke about and when you don’t play any defense, you get beat. I can’t explain what happened. We had a game plan and nothing worked. Everything fell apart in the beginning of the game and it blew up in our faces. We expected that Semih Erden would start, that didn’t surprise us, but we didn’t manage to deal with him. " "The second game is very dangerous. It’s a very big pleasure to play in front of these fans. But we didn’t yet finish the job. Now it will be more difficult; everybody knows how difficult it is to play in Tel Aviv. 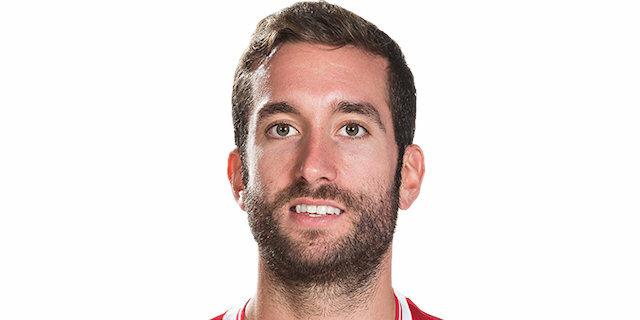 I hope that we will win the next game. We are going to win the next game. " "From the beginning they took control of the game and were first to every ball. On defense we were two steps behind on every play; that’s the story of the game. They built a double-digit lead and from that point it was very hard to catch them. Offensively we didn’t play right; a lot of times we came to the end of the shot clock in one-on-one situations and you can’t let that happen. "